Rockport Town Hall is located at 34 Broadway, Rockport, MA 01966; phone: 978-546-6894. Photo: Sewall-Scripture House, ca. 1832, 40 King Street, Rockport, MA. Listed on the National Register of Historic Places in 1982. Photographed by User:John Phelan (own work), 2010, [cc-by-3.0 (creativecommons.org/licenses/by/3.0)], via Wikimedia Commons, accessed September, 2017. Rockport was set off from Gloucester and incorporated as a separate town in 1840. It is located at the eastern top of Cape Ann, bounded on the northwest by Ipswich Bay, on the east by the Atlantic Ocean, on the south by Massachusetts Bay and on the west by the City of Gloucester. The first town meeting was held in March at the Church of the Congregational Society. Captain John Davis moderated, and Colonel William Pool served as town clerk. Richard Tarr was the first man to permanently settle in this town, at Sandy Bay. He erected a log cabin here about 1690. Tarr was born in England in 1660. He died in 1732 and left a large family of many children. Next to settle was John Pool who was born in Taunton, England, in 1670. He was a carpenter by trade and worked at his trade in Beverly with Richard Woodbury. It was Pool who furnished the greater part of the lumber used in building Boston's Long Wharf. 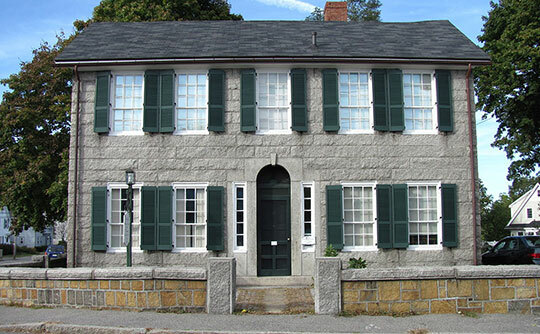 Rockport found a valuable article of export in the high-grade granite that everywhere underlies the town. Riggers who had learned their trade in the lofts of Gloucester turned their talents to erecting the quarry derricks, which with their spider webs of gray wires are today still a feature of the Rockport landscape, as are the piles of faulted blocks and the deep pools of the abandoned quarries. A special type of vessel was perfected in the shipyards of Rockport and the near-by towns for carrying granite. Up to the early 1900s these stone sloops were a picturesque sight as they lay loading in almost every narrow deep tongue of water along the outer Cape. The quarries attracted a colony of Finnish stoneworkers. Benjamin F. Arrington, editor, Municipal History of Essex County in Massachusetts, Tercentenary Edition, Volume I, Lewis Historical Publishing Company, New York, 1922.